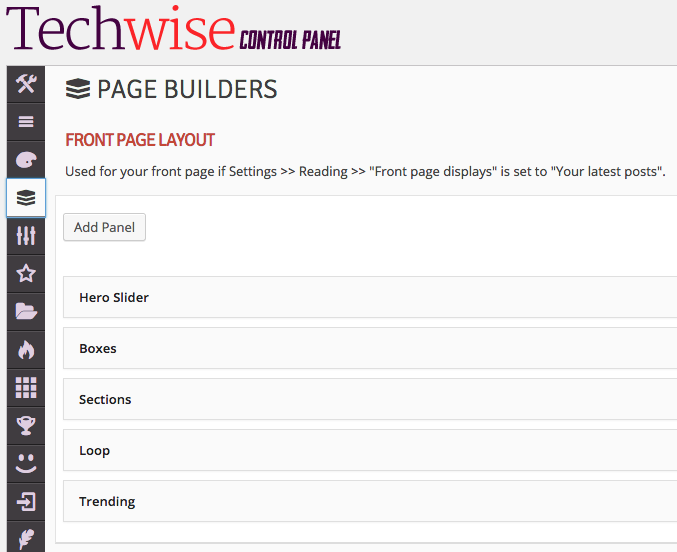 Important The folder you install/upload should be called “techwise” and contain the style.css file directly inside of it (this is the file that tells WordPress the name of the theme). Do not install/upload any other folder, such as “Techwise-Theme” for instance. This could potentially cause problems or at the very least confusion later on. Go to Tools >> Import >> WordPress >> Choose File and select the techwise.xml file that is provided with your ThemeForest download. The style scaffolding for this theme is provided by Bootstrap which enables all the responsive layouts and basic styling of most elements. The code for the bootstrap begins at the top of the style.css file, followed by the rest of the theme code. The responsive styles are at the end of the file. 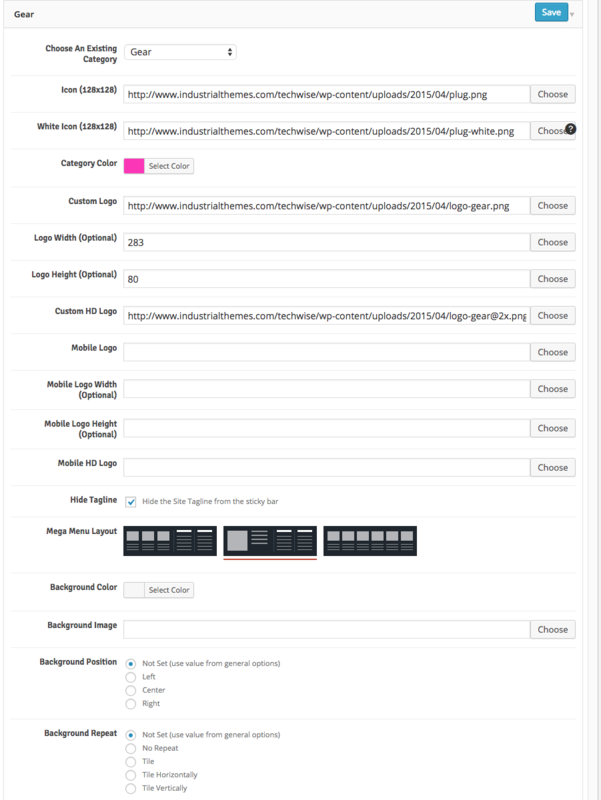 All of the page builders use shortcodes, whether used in the theme options or the shortcode generator. If building pages using the theme options, the shortcode is assembled using the it_shortcode() function at the bottom of the functions/theme.php file. All the possible shortcode attributes used by page builders are present within this function, and then the shortcode is passed to the corresponding shortcode file in the functions/shortcodes/ folder. Or, if building pages using the shortcode generator, these files are accessed directly (i.e. the shortcode is built by the shortcode generator). 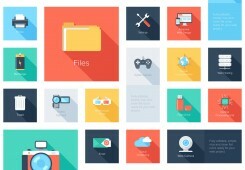 Within these files there are several layouts that are hidden using layers. 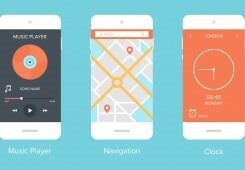 So you should find the layer for the corresponding layout and display it in order to see the styles and layout. For instance, in the single.png file all three post layouts are present, but by default only the “classic” style is displayed. However, using the layer selector you can see the “billboard” and “longform” layouts as well. The following guide was written to show you how to use all of the various components that come with the theme. You should take a look at the FAQ (available in the support portal) which address further specific important information about using the theme. Also very useful are the help tips located all throughout the theme options pages and single post/page layout options panels. Just hover over the question mark whenever you see one and further information about that option will be displayed. This is done to keep the overall look of the theme options pages as light as possible while still maintaining high usability. This theme is very versatile and was designed to be used for almost any kind of content or site setup. For demonstration purposes we will use the live demo for all of the examples given in this guide in order to help you understand the theme to its full potential. The first thing you’ll want to do after activating the theme is to setup your site’s front page. Go to Settings >> Reading and locate the setting Front page displays and make sure it is set as “Your latest posts”. 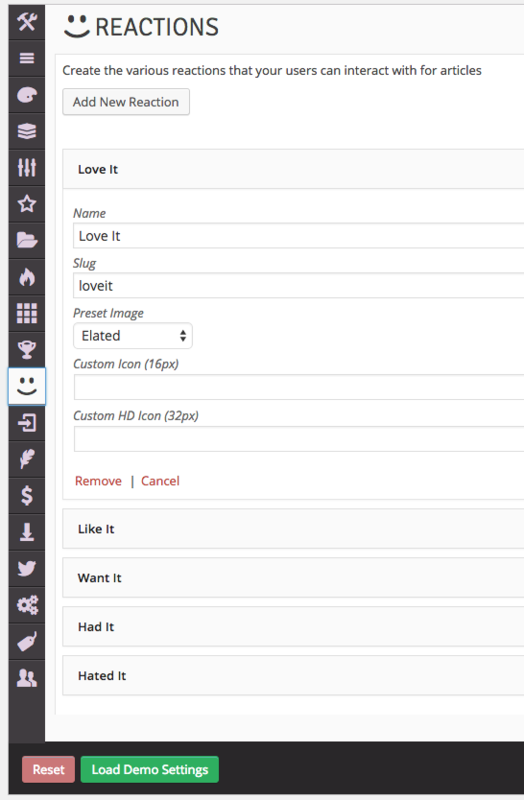 Then go into your Theme Options >> Page Builders screen and the first page builder will be for the front page. If you leave this blank by default your front page will display the Loop component with infinite loading enabled and nothing else (except the header and footer which appears on all pages). 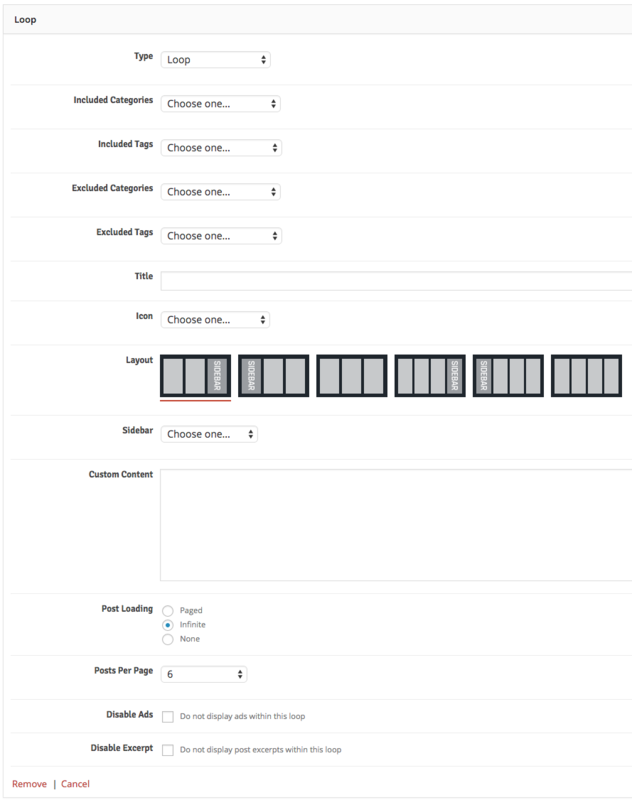 This will cause the front page to use five page builders in the order that you selected them. First it will display the main hero slider, followed by the two boxes below it, then the horizontal set of sections with a sidebar, then the main loop, and finally the trending slider. The header and footer will automatically display since they are set to display on every page regardless of your page builder selections. If you re-order those components they will be re-ordered on your site front-end as well, and if you added or removed more components that would also be reflected on your site front page. Remember If you have a caching plugin active such as W3 Total Cache or WP Super Cache, making changes to theme options will require you to flush/empty your cache before they are reflected on your site’s front end. This will look for the latest 3 posts with the hero tag assigned and rotate through them (regardless of how many posts are actually tagged hero). If you were to leave the Included Tags unselected, it would loop through the latest 3 posts overall. 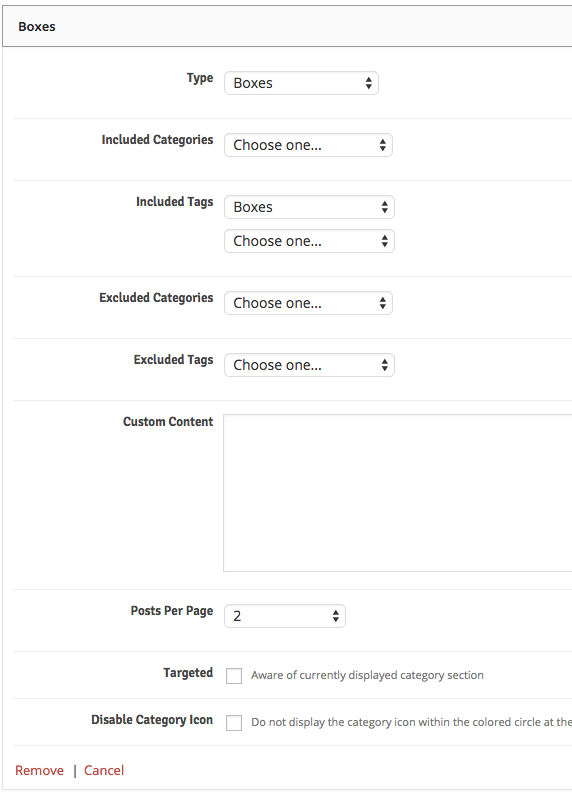 This will look for the latest 2 posts with the boxes tag assigned and display them in one horizontal row (regardless of how many posts are actually tagged boxes). If you were to leave the Included Tags unselected, it would display the latest 2 posts overall. This will display 3 sections of posts, from the Phones, Tablets, and Laptops categories, respectively, followed by a sidebar on the right. It will only display the latest 5 posts from each category, and the first post will be a larger format, followed by 4 smaller format posts for a total of 5 posts. This will cause 3 total rows of posts to display before the LOAD MORE button is displayed. Each time the load more button is clicked, 3 more rows will display at the end of the post loop. This will display your latest 10 posts without any time period constraints. You can see here that we have “tricked” it by titling it “Trending Today” even though the posts are from all time. The reason is because the demo content is very static and will never be added to, so we didn’t want this to be blank. In your live environment it would make more sense to actually select a time period other than all time since you’ll be adding new posts to your blog. That’s it! Your front page will now be setup just like the live demo and you are ready to move on to more of the theme’s features discussed below. 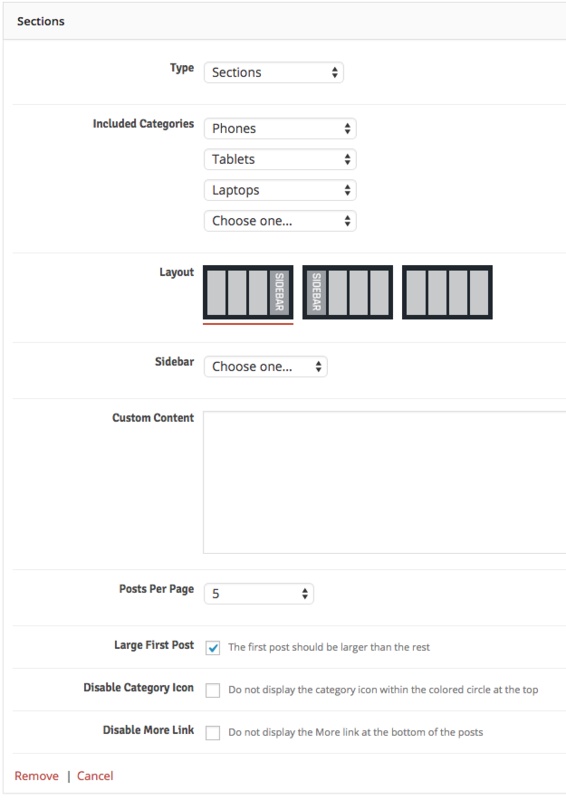 Using page builders and shortcodes (discussed below) you can create any number of layouts within your site. However, there are some constant variables that apply site-wide that pertain to your post loops and pagination. It’s important to understand the scope here. We’re referring to how the post looks when it’s displayed in a loop, not what posts to display in the loop. For instance, hiding the heat index on a post, not telling a loop to display posts from the Laptops category (for the latter, see the page builders and shortcode generators sections below). Also, since pagination options won’t change from page to page they are also contained in one place to avoid redundancy and “option bloat” (e.g. you won’t disable the next and previous arrows in pagination in one category but display it in another – that would result in an inconsistent experience for the user). 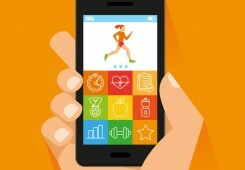 Not all of these options will specifically apply to every post loop and widget, but any relevant post loop instances will be affected by these settings. Now we will get into how to actual adjust the layout of various pages throughout our theme. 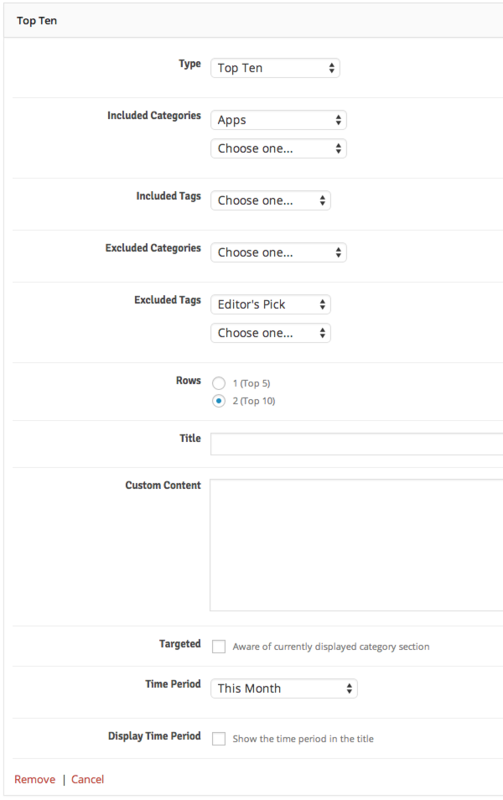 Helpful Tip When you select the Custom Content page builder, use this field to enter the content that you want to display. For all other shortcodes this is purely an optional field. 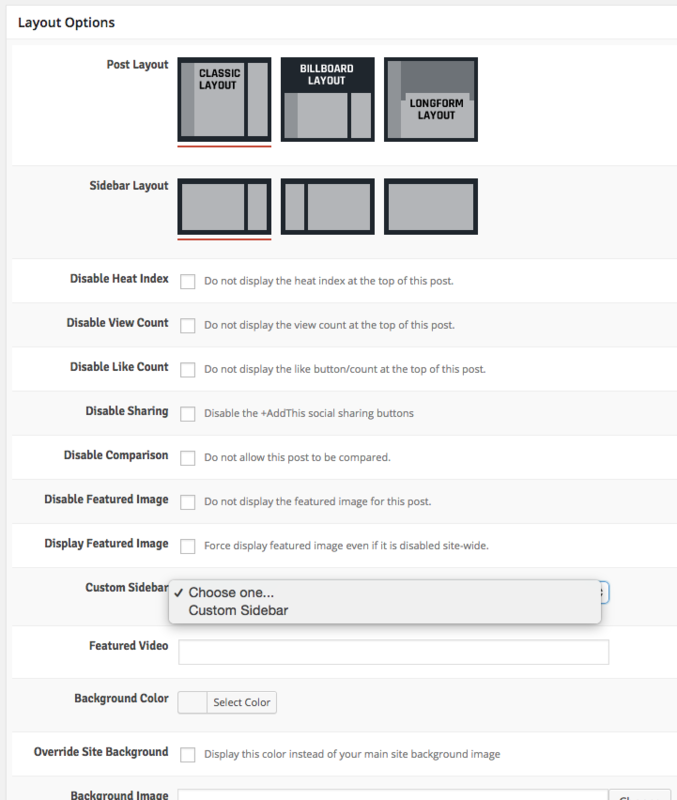 Go to the Theme Options >> Page Builders screen. 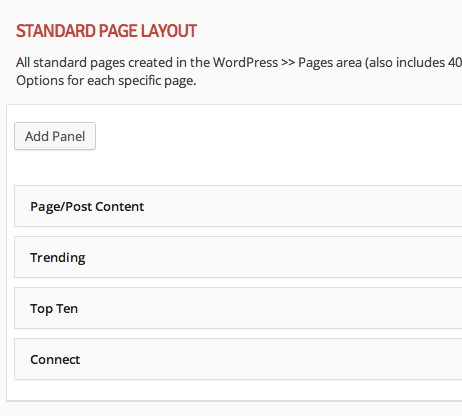 We are adjusting the layout of the standard WordPress pages, so we’ll locate the Standard Page Layout section. Page/Post content does not have any settings. Think of this as a placeholder, telling the builder where you want the page content to go. If you go to the WordPress pages screen and add a new page, any content you input to that page will display in this location. So if you create an “About” page for instance, you would see the top ten posts first, then whatever content you enter into the about page, then your trending posts, then your connect bar. The top ten, trending, and connect would be the same on every page, and the page/post content would be what changes per page. Helpful Tip You can alternatively leave your page builders completely blank for any and all page builders within the theme options, because each page has a default builder layout. So you only need to make selections here if you wish to deviate from the default layout. Important If you do choose to build out the Standard Page Layout, Single Post Layout, or Author Listing Page Layout, you must at a minimum select Page/Post Content as one of the page builders. Failure to do so will result in none of your page content actually displaying on the page! 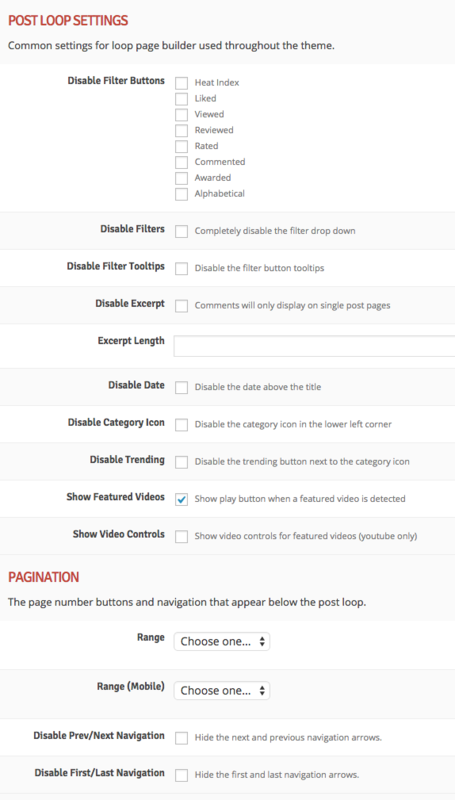 You can leave the Trending page builder at default settings for this example. Bonus! This is really a “two-in-one” page builder since it lets you select one row instead of two, essentially turning it into a top five page builder if you want to go that route. The category and tag limiting/excluding lists work together and not against each other. 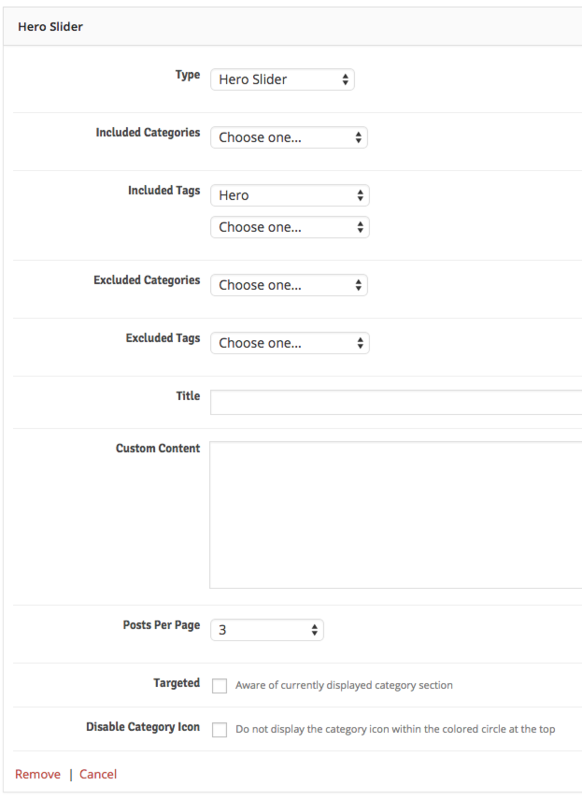 For example, if you select two limiting categories and two excluding tags, the results will include posts in either of the two limiting categories (they don’t have to be in both categories), but not in either of the two excluding tags (posts don’t have to have both tags to be excluded). Clarification “Limiting” a category or set of categories means you want only posts within that category or set of categories to display in the results (i.e. you are limiting the results to that category or set of categories). “Excluding” a category or set of categories means you want to exclude posts within that category or set of categories from the results. That’s the gist of the page builders in the theme options. But what if you want to have a one-off page with a custom layout? 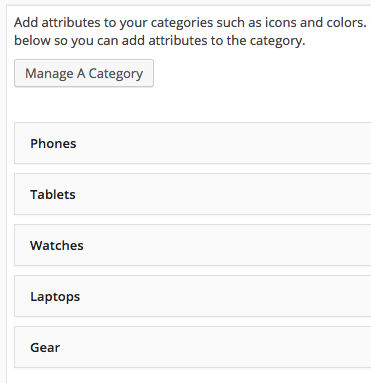 Or what if you want each of your category sections to have a different layout? All of that is discusses within the next few sections. The theme has a very handy and powerful shortcode generator built in. You can access it from the page and post editing pages below the post content editor. Everything you need for creating and inserting shortcodes into your content is available in one place. First and foremost, this is the second option for created custom page builder pages, as mentioned above in the Page Builders section. 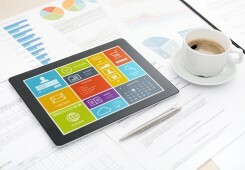 It is also used for styling your post and page content, such as adding buttons, tabs, and icons. Using the page builder shortcodes should be familiar since it follows the same technique as the Page Builders section above, but we’ll explain why you would want to use the shortcode generator for this. Finally, we recommend unwrapping the page for best results. This will cause each of the page builder shortcodes to be contained in their own wrapper instead of all together in the same wrapper. Select the Unwrap Page option at the bottom of the Layout Options. 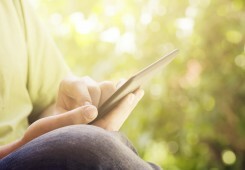 Publish your page and you’re done! The beauty of shortcodes is that you can just copy and paste them anywhere you want within the theme without having to even use the shortcode generator if you want. To see what we mean, create a new page and just copy and paste in the shortcode content above – you’ll get the same result! Note As you can see in this example we have named the page “Gear Section” so that it has a different page slug than the Gear category. This is to avoid any permalink confusion within WordPress. It doesn’t matter what you name this page, it’s only for internal use – it is not what is used to connect this page to the category (see below). We’ll walk through three examples from the live demo which will give you enough understanding to use the rest of the shortcodes. We’ll use the Shortcodes and Typography page present in the live demo. First we’ll do something simple and create a button. Then we’ll “popover” enable it. Finally we’ll do something a little more complicated and create a series of tabs. If you save and view your post you’ll notice two buttons on the page, the first one won’t do anything, and the second one will have a popover effect. Lastly, we’ll create our tabs shortcode and add it the the post as well. That’s it! The rest of the shortcodes work the same way. 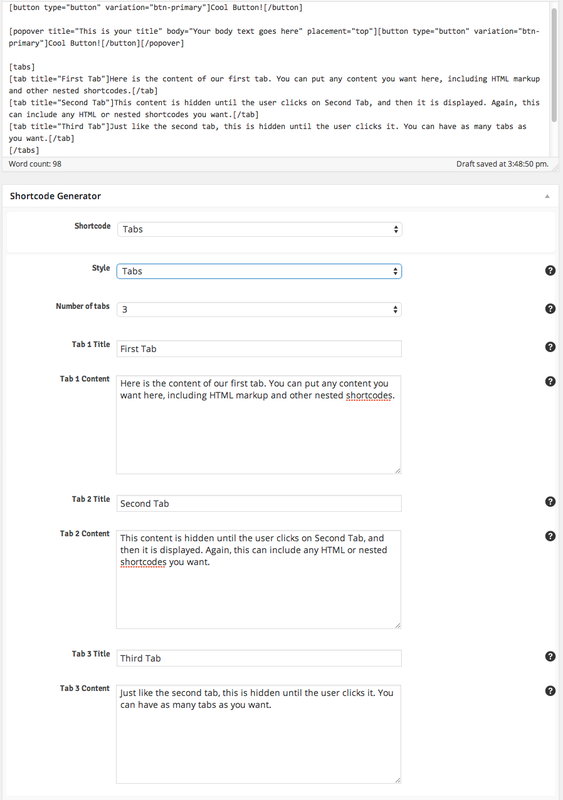 You just select the shortcode from the list, add/edit the options and content for the shortcode, and send it to the editor. You can nest shortcodes within other shortcodes just like the popover example above. The possibilities are endless! Helpful Tip Once the shortcode is added to your content editor, you don’t have to use the Shortcode Generator again if you want to modify it. 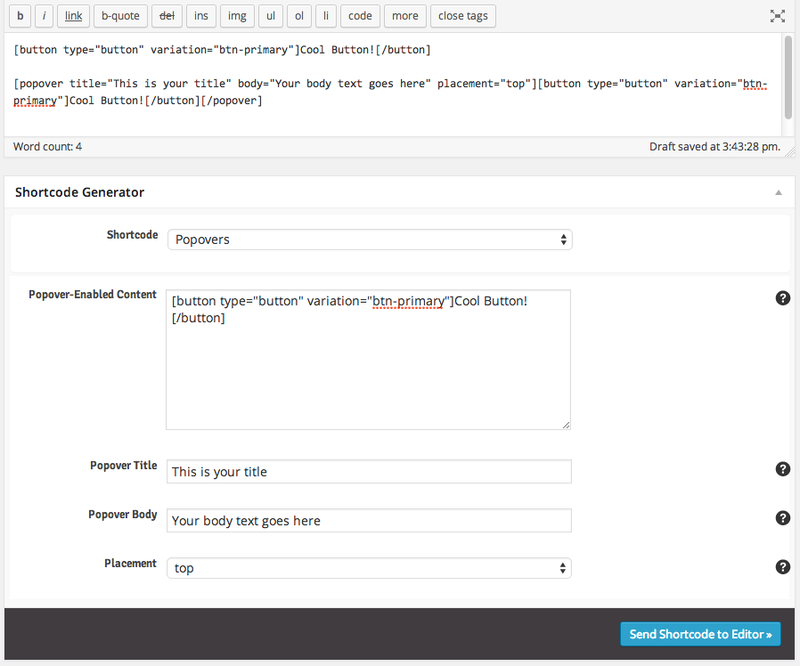 You can change the content or options for the shortcode directly in the content editor. Of course, if you feel more comfortable using the fool-proof generator to re-do your shortcode with the changes, it is always available to use. You can view all of the resulting markup on the live demo shortcodes page without having to import the demo content if you need it for reference. Use the button below to expand it. [tab title="Tab 1"]Praesent vitae orci tortor. Nunc commodo turpis nisl, et pellentesque turpis fermentum in. Sed a tellus in neque convallis eleifend. Maecenas mattis nibh id imperdiet sagittis. Cras vehicula sollicitudin velit sed blandit. Nunc fermentum metus hendrerit quam ultricies, eget cursus elit semper. Duis tincidunt nunc et facilisis faucibus. Quisque tincidunt luctus gravida. Proin aliquam et mauris id rutrum. [tab title="Tab 2"]Praesent vitae orci tortor. Nunc commodo turpis nisl, et pellentesque turpis fermentum in. Sed a tellus in neque convallis eleifend. Maecenas mattis nibh id imperdiet sagittis. Cras vehicula sollicitudin velit sed blandit. Nunc fermentum metus hendrerit quam ultricies, eget cursus elit semper. Duis tincidunt nunc et facilisis faucibus. Quisque tincidunt luctus gravida. Proin aliquam et mauris id rutrum. [tab title="Tab 3"]Praesent vitae orci tortor. Nunc commodo turpis nisl, et pellentesque turpis fermentum in. Sed a tellus in neque convallis eleifend. elit semper. Duis tincidunt nunc et facilisis faucibus. Quisque tincidunt luctus gravida. Proin aliquam et mauris id rutrum. [toggle title="Toggle Panel 1 Title"]Praesent vitae orci tortor. Nunc commodo turpis nisl, et pellentesque turpis fermentum in. Sed a tellus in neque convallis eleifend. Maecenas mattis nibh id imperdiet sagittis. Cras vehicula sollicitudin velit sed blandit. Nunc fermentum metus hendrerit quam ultricies, eget cursus elit semper. Duis tincidunt nunc et facilisis faucibus. Quisque tincidunt luctus gravida. Proin aliquam et mauris id rutrum. [toggle title="Toggle Panel 2 Title"]Praesent vitae orci tortor. Nunc commodo turpis nisl, et pellentesque turpis fermentum in. Sed a tellus in neque convallis eleifend. Maecenas mattis nibh id imperdiet sagittis. Cras vehicula sollicitudin velit sed blandit. Nunc fermentum metus hendrerit quam ultricies, eget cursus elit semper. Duis tincidunt nunc et facilisis faucibus. Quisque tincidunt luctus gravida. Proin aliquam et mauris id rutrum. [toggle title="Last Toggle Panel"]Praesent vitae orci tortor. Nunc commodo turpis nisl, et pellentesque turpis fermentum in. Sed a tellus in neque convallis eleifend. Maecenas mattis nibh id imperdiet sagittis. Cras vehicula sollicitudin velit sed blandit. Nunc fermentum metus hendrerit quam ultricies, eget cursus elit semper. Duis tincidunt nunc et facilisis faucibus. Quisque tincidunt luctus gravida. Proin aliquam et mauris id rutrum. [toggle title="Accordion Panel 1 Title" expanded="in"]Praesent vitae orci tortor. Nunc commodo turpis nisl, et pellentesque turpis fermentum in. Sed a tellus in neque convallis eleifend. Maecenas mattis nibh id imperdiet sagittis. Cras vehicula sollicitudin velit sed blandit. Nunc fermentum metus hendrerit quam ultricies, eget cursus elit semper. Duis tincidunt nunc et facilisis faucibus. Quisque tincidunt luctus gravida. Proin aliquam et mauris id rutrum. [toggle title="Accordion Panel 2 Title"]Praesent vitae orci tortor. Nunc commodo turpis nisl, et pellentesque turpis fermentum in. Sed a tellus in neque convallis eleifend. Maecenas mattis nibh id imperdiet sagittis. Cras vehicula sollicitudin velit sed blandit. Nunc fermentum metus hendrerit quam ultricies, eget cursus elit semper. Duis tincidunt nunc et facilisis faucibus. Quisque tincidunt luctus gravida. Proin aliquam et mauris id rutrum. [toggle title="Last Accordion Panel"]Praesent vitae orci tortor. Nunc commodo turpis nisl, et pellentesque turpis fermentum in. Sed a tellus in neque convallis eleifend. Maecenas mattis nibh id imperdiet sagittis. Cras vehicula sollicitudin velit sed blandit. Nunc fermentum metus hendrerit quam ultricies, eget cursus elit semper. Duis tincidunt nunc et facilisis faucibus. Quisque tincidunt luctus gravida. Proin aliquam et mauris id rutrum. Donec vitae orci vitae mi varius molestie. Aliquam erat volutpat. Donec faucibus urna nec accumsan tempus. Vivamus venenatis risus sed orci dictum fringilla. <code>Vestibulum dignissim adipiscing nunc</code>, ac eleifend mi posuere ut. Suspendisse vitae porta lectus. Nullam ut eros ac velit semper sodales sed nec sem. Ut et tincidunt felis. 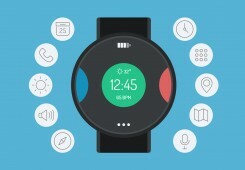 Curabitur aliquet iaculis erat, sit amet facilisis risus gravida eu. Curabitur consectetur elit non felis gravida congue. Curabitur quis leo est. Nam varius sed ligula in sollicitudin. Donec nisi ante, venenatis eget facilisis eu, rhoncus quis ligula. Curabitur varius, massa a fringilla condimentum, ipsum diam varius ligula, ac posuere metus neque a enim. Remember while this screenshot is from the theme options, this example actually requires that you add them in the Posts >> Categories screen first. The screenshot is just for simplicity sake. Click Save to save the options. The Gear category is now setup just like the live demo. You can do the same with the other categories mentioned above and choose whatever colors, logos, and icons you want. If you want to get the ones from the live demo, you should import the full live demo content according to the steps located at the top of this documentation. When you view posts within one of these categories, or the archive listing page for these categories (or any subcategories therein) you will notice the logo, icon, colors, etc. will match the settings you chose above. If you add these categories to your mega menu you will notice they will automatically display using the selected color/icon and will populate with posts within that category and even subcategories of that category within the mega menu panels. This is further explained in the next section. The section menu is the only one of the three that can be mega menu enabled. Both the section and main menus display in the sticky bar. The main menu displays below the logo, and the section menu displays to the right of it. The utility menu is used by the page builder of the same name and can be put anywhere in your site. 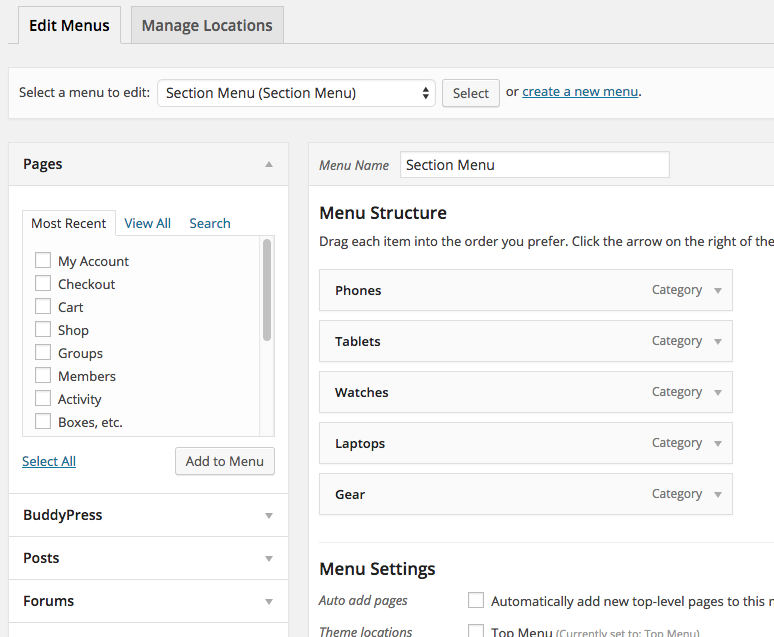 Go to the Theme Options >> Header screen to see all options pertaining to menu placement and functionality. We’ll set up the menu structure just like the live demo. You want to make sure you have the Sections menu set to “mega menu”. 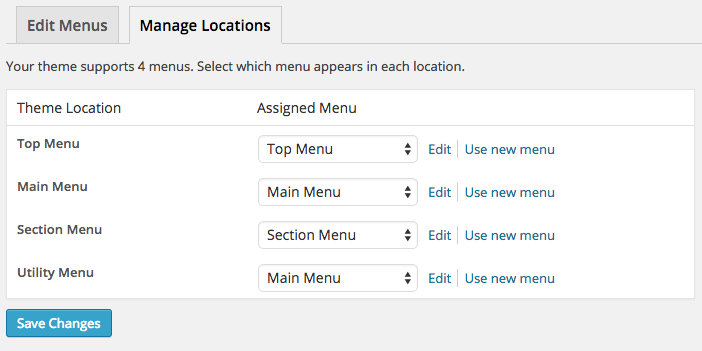 Once you have the settings how you want them in the theme options, the next thing to do is go and actually create and assign your menus in the Appearance >> Menus screen. Next, choose the main menu from the drop down and click Select. Add anything you want to this menu, it is not mega enabled and will display any pages, categories, tags, or custom links you want to add. Of course you are not required to use this menu if you want to use only the section menu above. Do the same thing for the top menu. Helpful Tip If you want menu items to have their own sub menu items, drag the menu item slightly to the right to indent it under its parent item, and it will be rendered as a drop down sub menu item on your site. You can do this multiple levels deep as needed. You can of course create a fourth menu specifically for the Utility Menu, but we chose to re-use the main menu in both spots for the sake of simplicity. Whatever you have selected for the utility menu is what will display wherever you choose “utility menu” in any page builder setup. 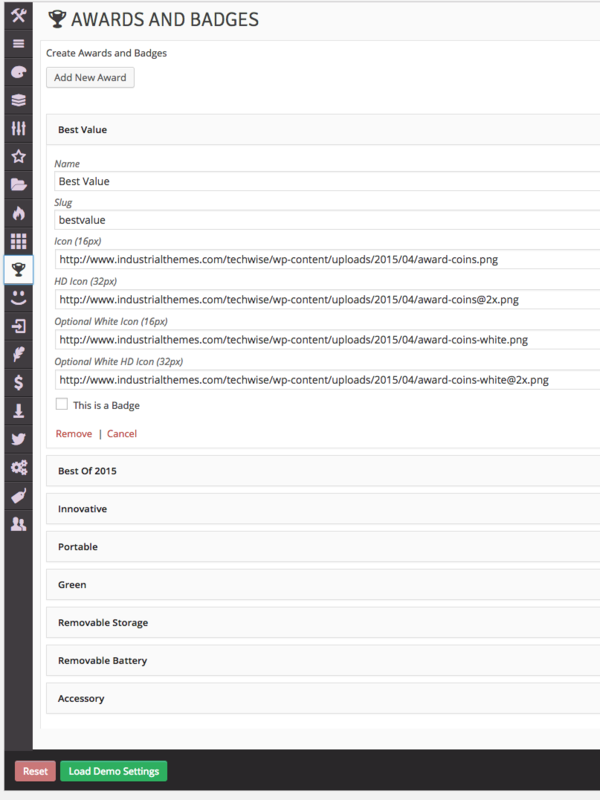 This theme comes with a built-in awards and badges system that does not require any third-party plugins. The icons and names of the awards and badges are custom assigned by you and there are no pre-packaged awards or badges (unless you import the demo content). We’ll show you how to add a few awards and badges and assign them to your posts. Info Unlike some of our previous themes, awards and badges will be fully functional on all of your posts, not just posts marked as reviews. Next open up a new post and notice the list of possible awards and badges to assign on the bottom right of the screen as shown in the screenshot below. Just select which award(s) and badge(s) you want to assign to this post, and they will appear on the front-end of your site – it’s as easy as that! 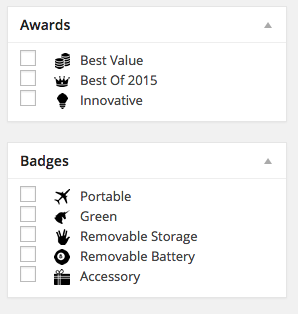 In the live demo there are several more awards and badges, but they are all added and managed the same way, so we have only shown the expanded options for one of them for the sake of brevity here. If you want all awards and badges from the demo feel free to import the demo content as is instructed towards the top of this documentation. This theme comes with a built-in user reactions component that does not require any third-party plugins. The reactions are a way for users to voice their immediate reaction to the article they have just read, and to display the results at the end of your articles for all users to see. It’s fully AJAX-enabled and updates immediately for ease of use and UX. Once you create all of your reactions, they will automatically become available for users to click on at the end of all of your posts. You can exclude certain reactions from specific posts if they don’t apply very easily. To do so edit a post and locate the Excluded Reactions panel at the bottom right of the screen. If you want to exclude a certain reaction from the post, just select it in the list and save the post. That reaction will no longer be available in the list of possible reactions for just that post. 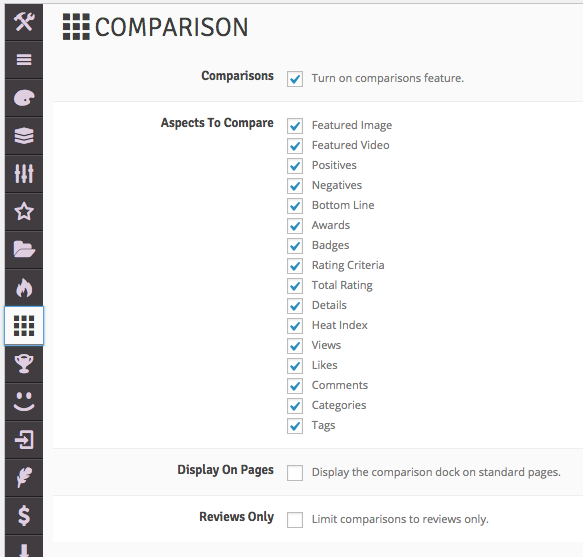 The comparison feature allows you to compare two or more items all on the same page. It can show any and all information about the posts, from title and featured image, to details, rating criteria, and even meta information like number of comments, likes, and views. That’s all you need to do. Clicking “Go” in the compare panel (after you add a few items to compare) will automatically find your compare page and generate the table there. 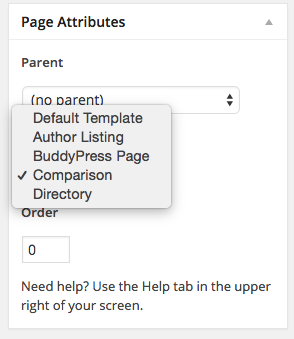 Info You can also disable comparisons on a per-post or per-page basis in the Layout Options below the content editor. The heat index feature lets you define rules for how a post obtains a heat index. It’s a way for you to find the total popularity of a post by taking into account not only it’s views or likes, but everything together, including number of comments, number of views, number of likes, number of user ratings, and number of user reactions. It also assigns heat indexes to categories and tags based on the posts within them in a certain time period (optional). 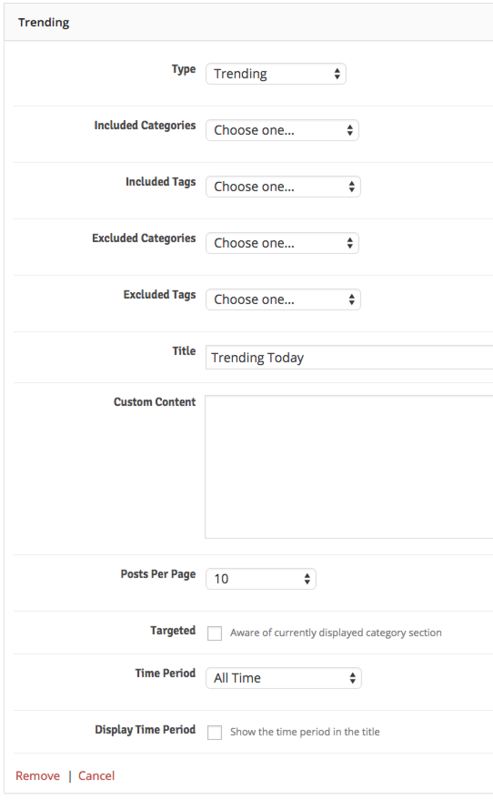 You can then use widgets to display your trending topics (categories and tags). Each post starts off with a heat index of 0 which then increments based on the users’ action. If a post is viewed one time by one user, its heat index will become 1. If it’s viewed by 5 users and two users click the like button, its heat index will become 45 (20 * 2 plus 1 * 5). 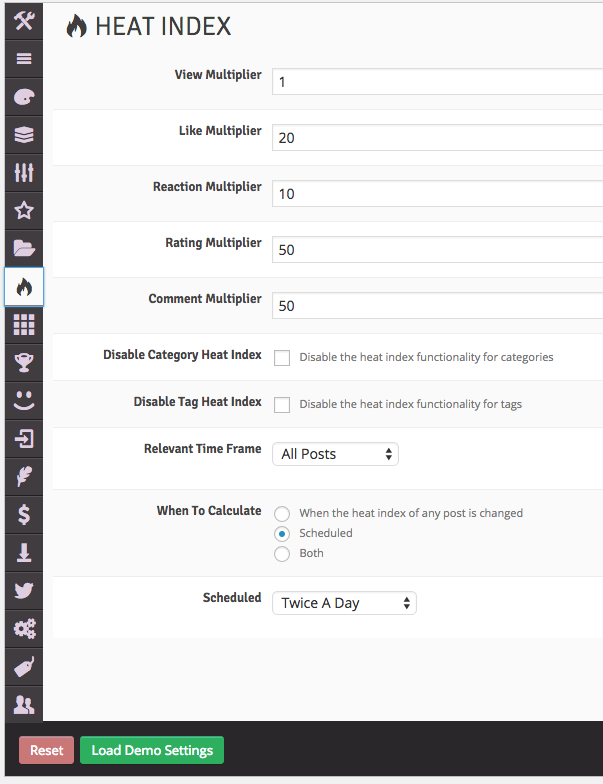 You can turn off heat indexes for categories and tags if you wish to only use them for posts. You can also set up rules to automatically calculate the category/tag heat indexes on a schedule, or even every time a heat index changes. Warning Setting the “When to calculate” frequency to “When the heat index of any post is changed” or “Both” will potentially be taxing on your server resources, especially if you have a lot of users. We recommend this setting only for sites with less traffic, or sites with more server resources, or for temporarily manually rebuilding your heat indexes without having to wait for the scheduled batch. Finally, you can assign this custom sidebar to any and all posts or pages. 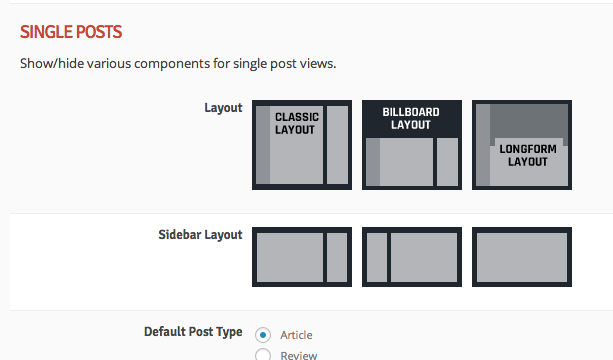 Open a post and locate the Layout Options panel below the post content editor. 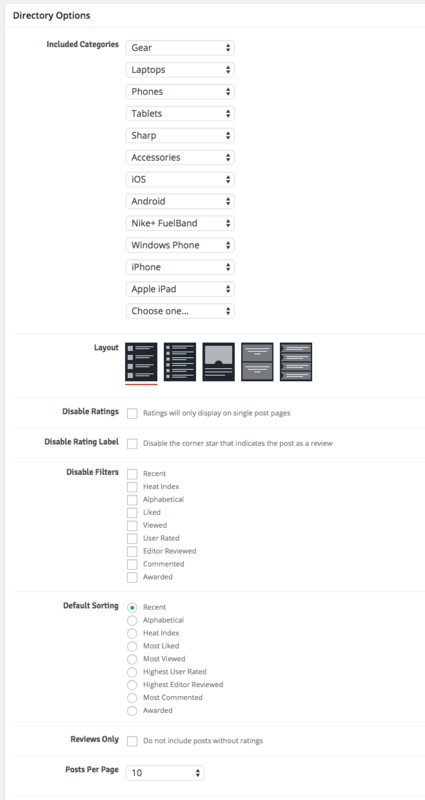 Within this panel you’ll see an option for a Custom Sidebar. 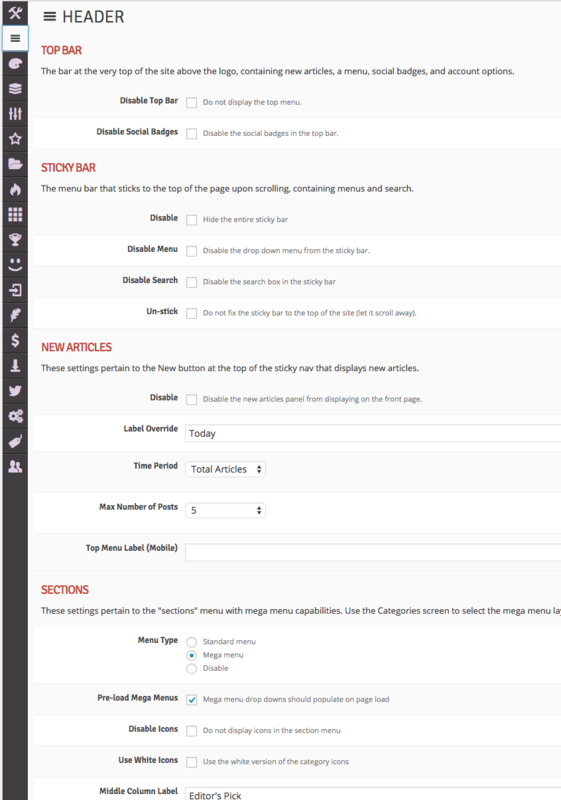 All of the custom sidebars you have created in your theme options will appear in this list. Just choose which one you want to use for this post and it will be used instead of the standard post sidebar. 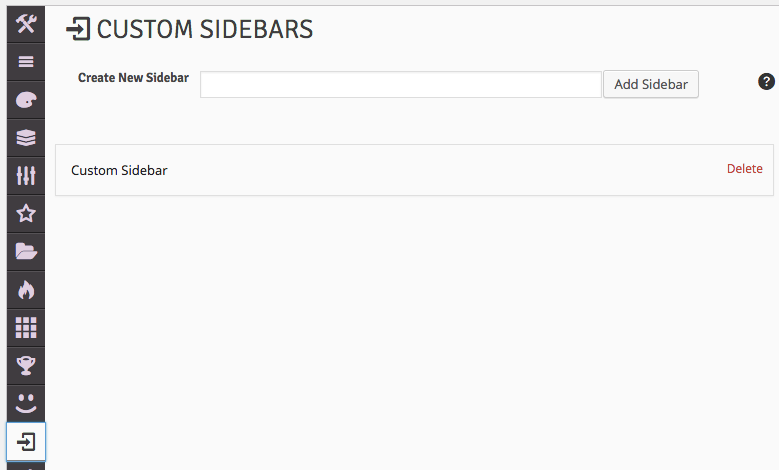 Info The custom sidebars are a one-to-many relationship with posts, pages, and page builders. 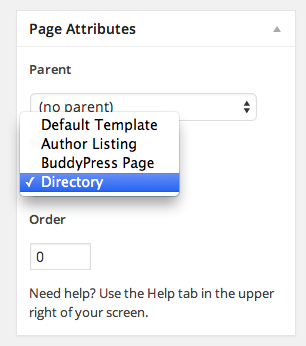 That is, you can assign any one custom sidebar to as many pages, posts, or page builders as you wish. 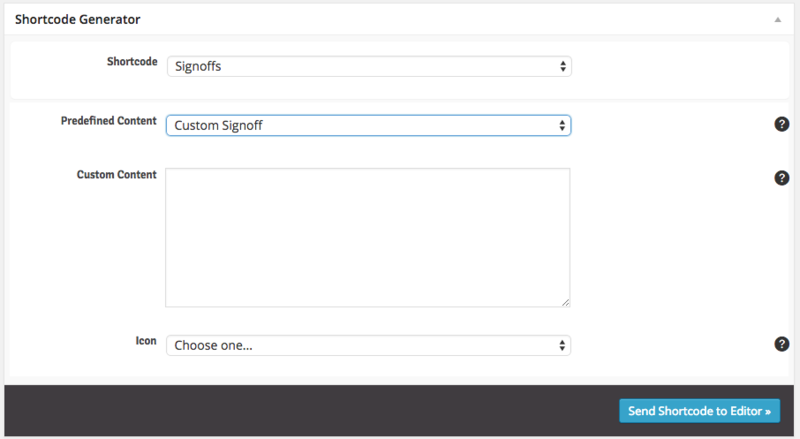 You can create an unlimited number of custom “signoff” boxes. A signoff is a way of putting standard content at the end of each of your posts, such as information about how to contact the editor, or a disclaimer of some kind. It’s really a catch-all for any content that you want at the end of every post. However since you can create as many as you want, you can have different groups of standardized content, showing one signoff on certain posts and a different signoff on other posts. The beauty and benefit of the signoff is that you don’t have to re-write the signoff for each post. 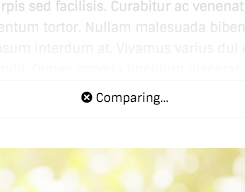 You do it once in the theme options and then add it (via a shortcode) to any post or page you wish. 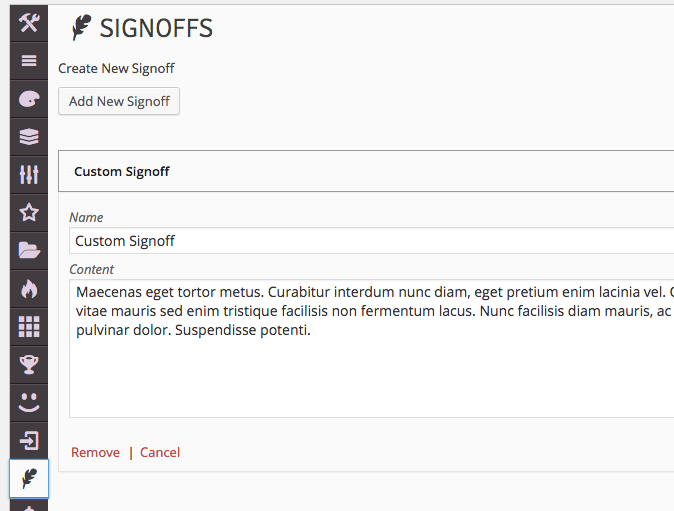 You can even specify one-off signoffs directly within each post if you so desire. Info To overwrite the pre-defined signoff with custom one-off text for just this instance of the signoff shortcode, enter your content into the Custom Content textbox. You can still select an icon to use if you go this route. The theme comes with a robust review system with four different metrics and the ability to add extra details to your posts, including positives, negatives, and a bottom line. You can review-enable any standard post without worrying about any complicated conversion processes or custom post types. Here’s how we did it in the live demo. First, access the review settings in the Theme Options >> Reviews panel. Then add your details and rating criteria here. Choose Numbers as the metric to use. Add all of the possible rating criteria you will ever want to use on any of your posts here and then you can selectively add them to each post. They will not all display on every post by default. You can always come back later and add in new rating criteria to assign to your posts. Info The metric you choose in theme options does not limit you only to using that metric for your whole site, it’s just a default. 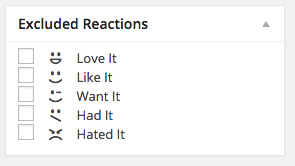 You can selectively use a different metric on a per-post basis in the Review Options panel if you want. Here are the criteria we added in the live demo. We left the weight blank for each of the criteria, but if you want a criteria to have more weight in the auto-averaging of the total score, give them all relative weights. We also added various details as well. Add whatever you want for your details fields. 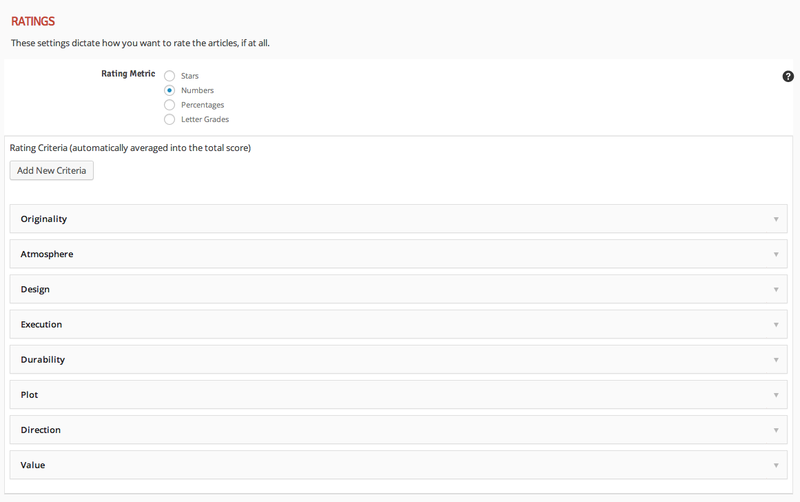 They are similar to criteria in that they only display on the post if you have entered content (i.e. leave them blank to exclude them) but they obviously don’t carry any rating value, they are purely informational (and optional as well). 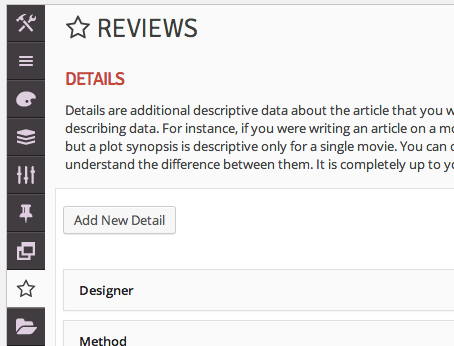 Now go to any post and notice the available rating criteria in the Review Options panel below the content editor. Enter positives, negatives, and a bottom line for the review, and then make your rating criteria selections. Only select values for the criteria that you want to use for the post and leave the rest set as Choose One… or No Rating. 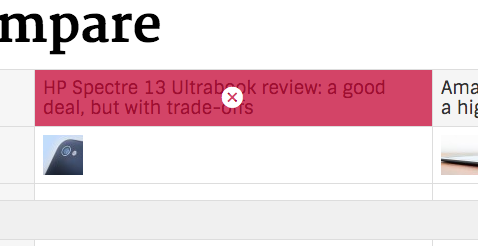 Helpful Tip You can selectively exclude editor ratings! Just select Users can rate (no editor rating) and that will allow users to rate that criteria on the front-end while not displaying anything for the editor rating for that criteria. Info To disable the positives or negatives for a specific post, just leave the field blank and the theme will completely hide that area. You can override the auto-averaged total editor rating if you want to. To do so, just select a value for the Total Score Override option at the bottom of the list of rating criteria. This is the value that will be displayed to the user for the total rating of this review, regardless of what values are selected for the rating criteria. You can reset user ratings for a specific post if you want to. To do so, scroll to the very bottom of the post edit screen and find the Reset Values panel and choose the Delete User Ratings option and then save the post. You can do the same with resetting likes, view counts, and user reactions as well using this panel. 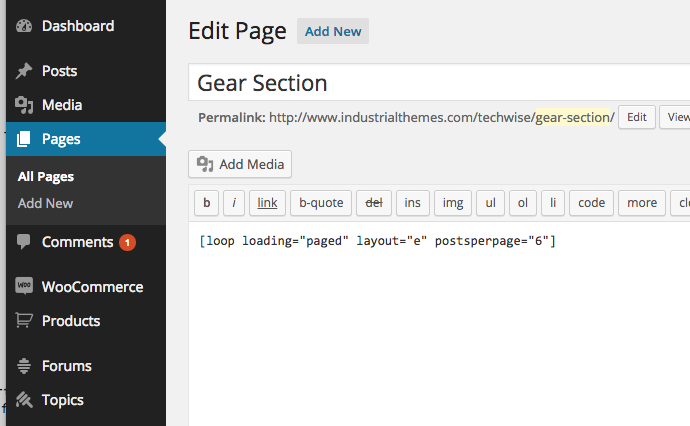 You can easily organize your posts using what are known as Contents Menus using shortcodes. This will create a contents menu that displays on your posts that lets the user navigate around the various sections of it. This is useful for very long and involved posts, especially using the Longform post format, and is especially useful for review posts with many sections of content. 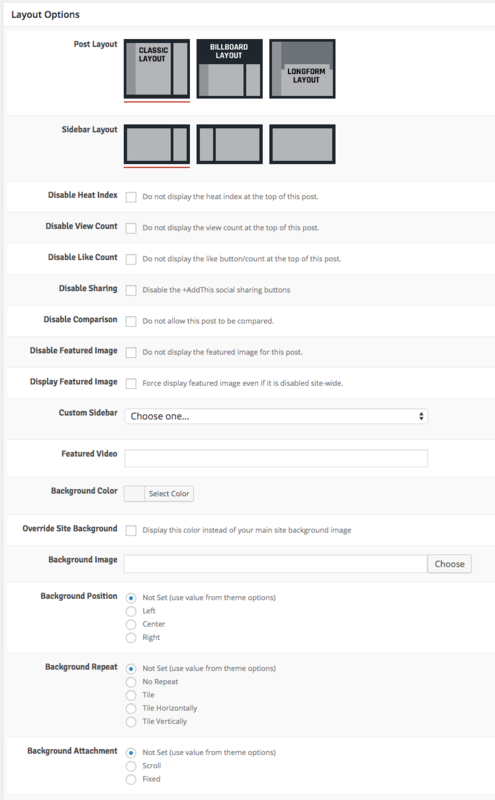 The first step is to adjust the display behavior of the contents menu within posts. You can set it to display for all posts, only review posts, only posts that you specifically tell it to display on, etc. 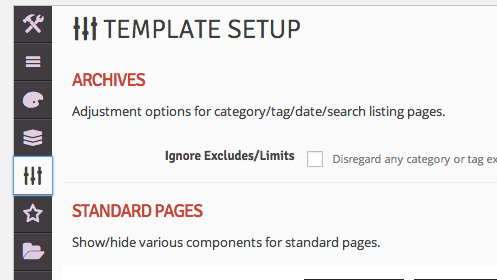 To do so, go to the Theme Options >> Template Setup screen. Then scroll down to the Single Posts section and find the Contents Menu Behavior section. If you want it to display for all posts, choose the first option just like the live demo.
. The label corresponds to what displays in the actual contents menu – it’s the menu item the user clicks on to be taken to that section. 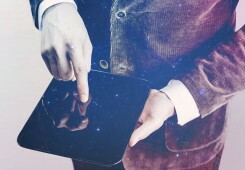 It is not what displays in the actual content – that is up to you. 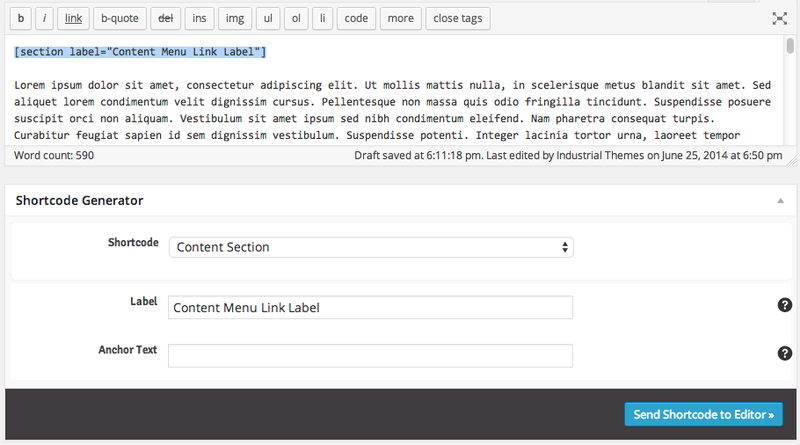 For instance, put a header right underneath the shortcode with matching text if you want that section of your content to have a header that matches the contents menu label. This is purely a means of separating your content so the contents menu can find the various sections. Helpful Tip Using Cyrillics or other special characters in the names of your contents menu labels? Not to worry, just specify a non-Cyrillic value for the Anchor Text of the menu item. 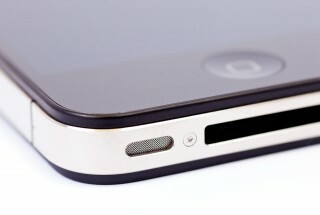 This will not display to the user, it is only used for anchor linking purposes. Info There is no limit to the number of sections you can add to the contents menu, other than the limitation of the users’ vertical screen viewport height (since the contents menu lists items vertically). To recap, we have selected our desired section categories created previously with Layout A. We have set the default sorting to Recent (but since we didn’t disable any filters the user can adjust the sorting on the front end). We could have selected only posts with reviews to effectivaly create a review directory within our site. Or we could have created a separate directory page for each of these categories if we preferred. Info You do not need to enter any content into the page content editor. However any content you do enter will display above the directory listing. The general section contains ads that display on all pages throughout the site and is made up of the header ad and the footer ad. The page builders section contains ads that display above and below each instance of a page builder, which means these ads will only display on pages where there is a corresponding page builder. 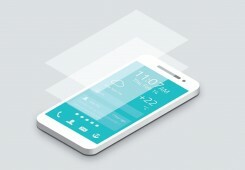 The single posts/pages section contains ad slots that display within single post and page content, such as after the post title, featured image, content, comments, etc. 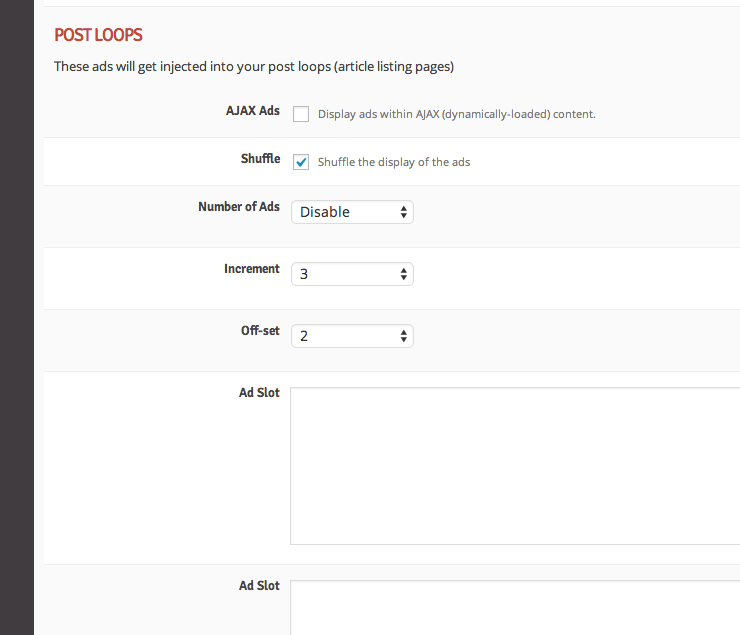 And finally the post loops section contains a sophisticated mechanism for inserting ads within your post loops. The first three are self-evident, but the post loops section having more functionality requires some explanation. Each ad slot will show up between a row within the loop. 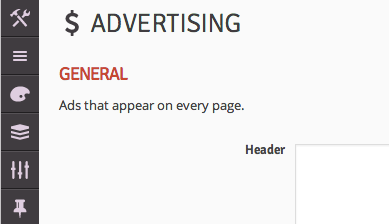 You should enter ad content into at least as many ad slots as you have selected for Number of Ads. If you offset the ads, the first add will not display until after x number of rows of posts have been displayed, and then after that it will display an ad after x number of incremented rows. So if you have the offset at 2 and the increment at 4, it will display an ad after the second row and then after every 4 rows thereafter. The AJAX ads option is so you don’t end up with blank ad spots on subsequent pages if you’re using an ad vendor that does not allow their ads to be displayed in dynamic content (such as Google adsense). 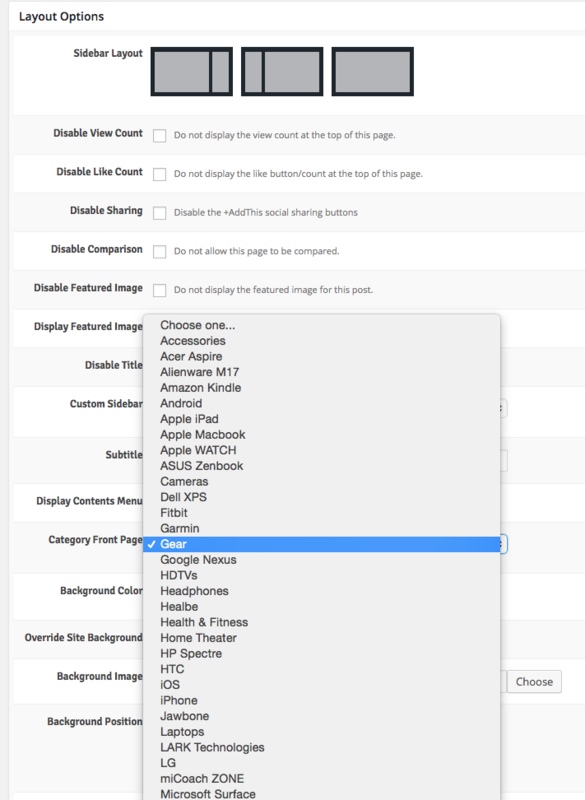 You can safely turn on this setting if you are using any other ads, such as standard image/HTML ads. 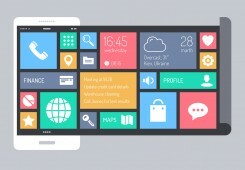 One of the features that makes this theme so unique is the ability to create three different overall styles of posts, including Classic, Billboard, and Longform. Both classic and billboard layouts are capable of displaying sidebars on the right if you want. Longform is a new theme feature and is for a more in-depth reading experience for the user, simplifying the layout and focusing on the art of writing by getting rid of the sidebar, adding more margin/padding to the content, and using a larger font for the content. All three layouts display the contents menu on the right for easy access. Billboard shows a much larger image and title at the top than classic, but doesn’t expand the body copy as much as longform, so it’s convenient if you want to highlight the title and image of the post, but then present a standard post reading experience thereafter. 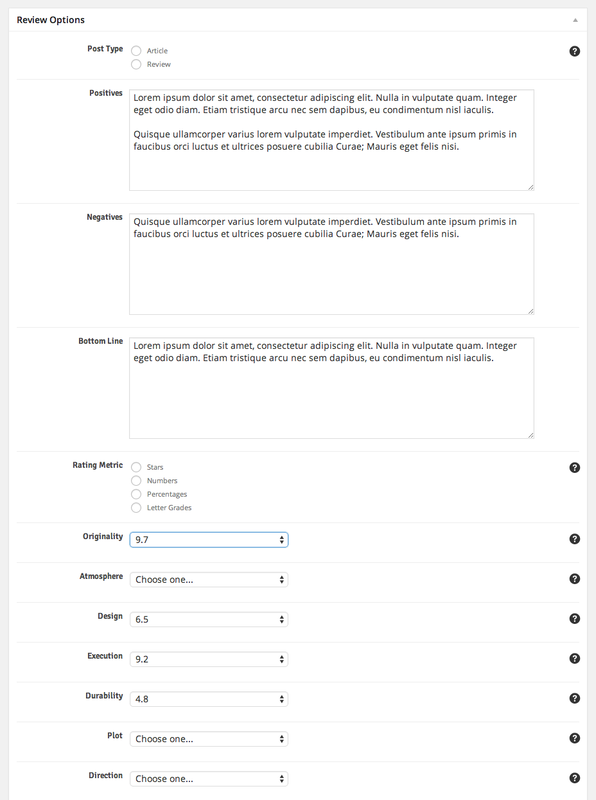 You can additionally specify a layout to be used for each specific post using the Layout Options below the post content editor. You’ll notice many other options available in these places as well which manipulate the layout and style of the post, such as display of the sidebar, subtitle, featured videos, etc. Install these plugins according to their standard installation instructions. Once you have installed any of these plugins, you’ll notice in the theme options that a new panel is created giving you some options to control how pages within the plugins display. 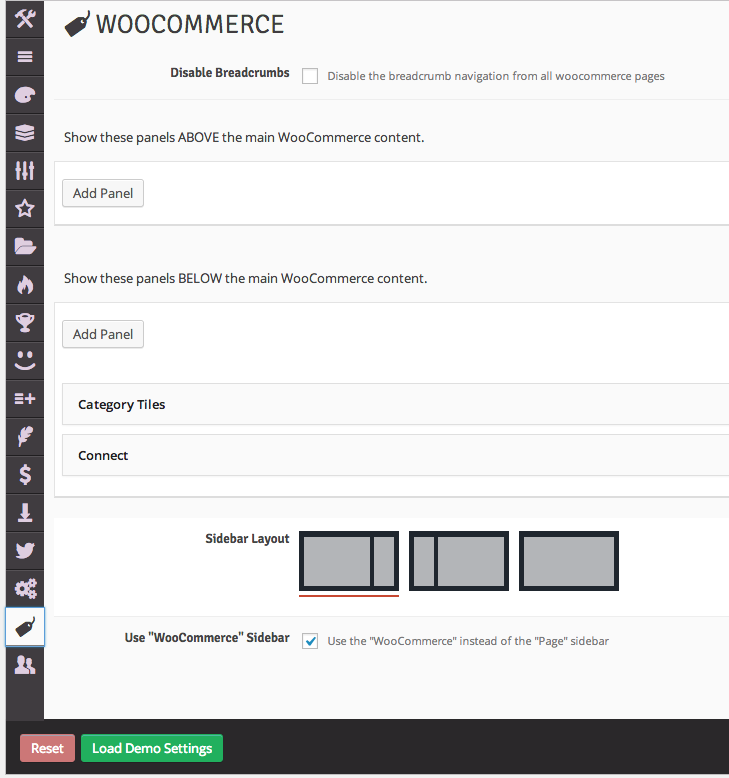 Both the BuddyPress and WooCommerce theme options tabs are added to the bottom of the list of existing tabs. Using these tabs you control the layout of pages within the plugins. For instance the shop and checkout pages within WooCommerce, the activity and group pages within BuddyPress, and the forum pages within bbPress. One of the options you have control over is whether unique sidebars are used for these plugins. If you select the unique sidebars to display you’ll be able to add widgets to them using the Appearance >> Widgets screen just like if you were to create a custom sidebar as described in the previous section. 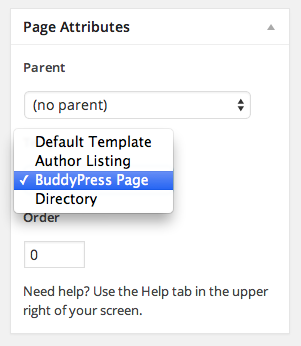 Because of the way BuddyPress is built versus how WooCommerce is built, you will need to edit your BuddyPress pages that were created when you installed BuddyPress and assign the BuddyPress Page template in order for the settings within the theme options to take effect. WooCommerce does not require you to do this. 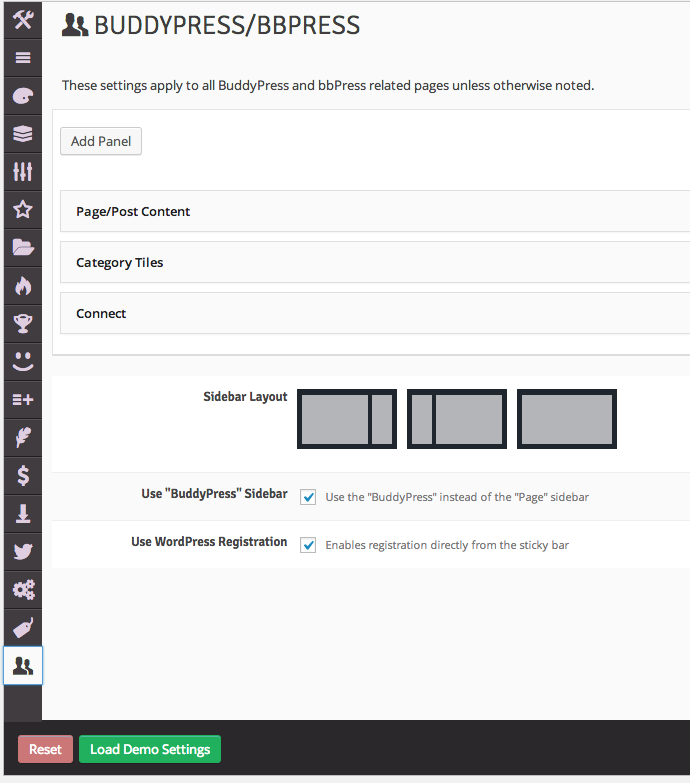 The BuddyPress and bbPress pages both use the BuddyPress theme options panel. You cannot separately adjust settings for only the bbPress pages at this time. 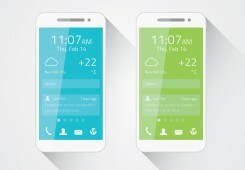 Explanation: This comes from the +AddThis sharing plugin. Even though is a low priority enhancement according to GTMetrix, if you do want to improve it you would need to get rid of +AddThis for sharing. Explanation: This only applies to images that are available for users to upload one by one in the theme options, such as awards, badges, and category icons. We use them as background images for performance reasons, and that in turn trips the flags in some of the performance testing tools even though it’s irrelevant. Info This refers to the following themes: SwagMag, Made, Flavor, and Steam. Upgrading from our newer category-based minisites themes (Explicit, Implicit, and Engine) does not require you to follow these steps. Copyright © 2018 Techwise, All Rights Reserved.